Michigan plumbers must complete a 5-hour code update course by April 20, 2018. The course must correspond to the 2015 Michigan Plumbing Code Rules set forth by the Michigan Department of Licensing and Regulatory Affairs on April 20, 2017. 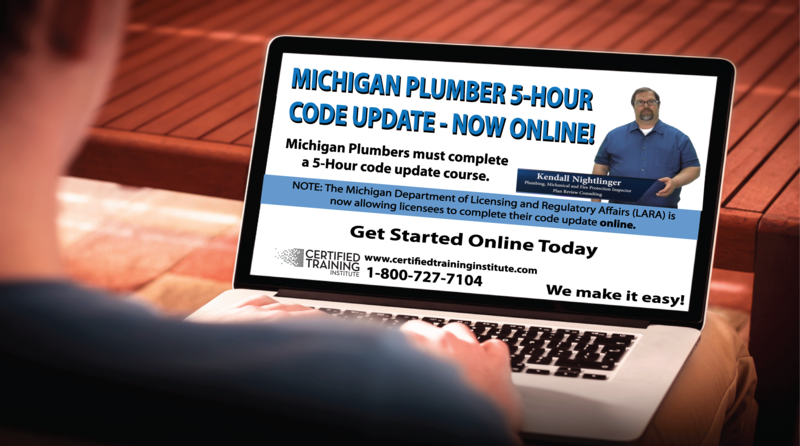 NOTE: For the first time, Michigan is allowing plumbers to complete their code update course online. What is included in the Michigan plumbing code update course? The Michigan plumbing code will cover code changes pertaining to both commercial and residential plumbers. Where do I find a Michigan Plumbing Code Update Course? Plumbers Training Institute offers an online, Michigan approved 5-hour Code Update course. This course is available 24/7 at your convenience for 6 months after the date of purchase. Who submits my 5-hour code update certificate of completion to the state? The state of Michigan does not require certificates be submitted unless they are audited. Plumbers Training Institute provides printable certificates immediately after course completion, we are also happy to mail certificates to plumbers without access to a printer. This entry was posted in Plumbing and tagged 5-hour code update, Michigan Plumbing update.